This Yoga practice supply/tool is filled with Organic buckwheat hulls and has a velcro closure under the carrying handle, so that hulls can be added or removed as needed. This also makes it easy to empty, so that the whole cushion can be washed, dried and easily refilled. Due to the buckwheat filling, the Meditation Cushion not only has an impressive grounding effect but is also supportive and stable. 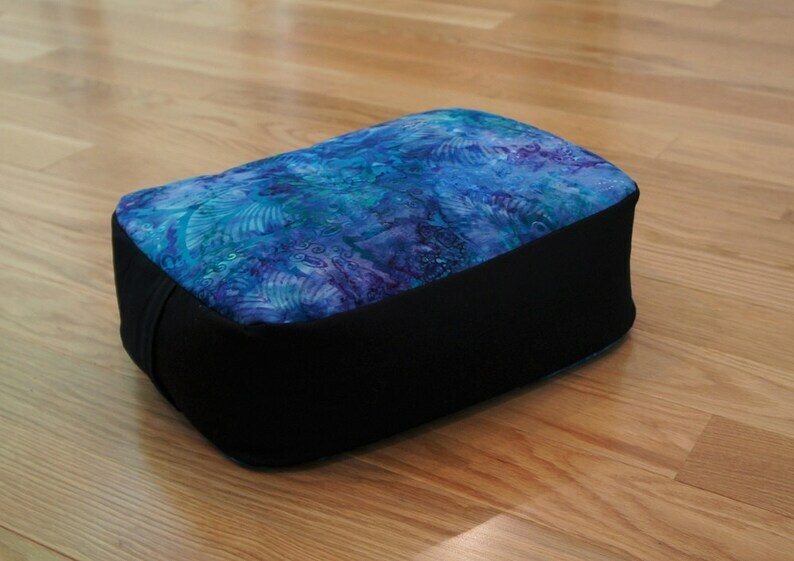 My students use the Meditation Cushion for seated poses, head and neck support, leg support and restorative poses. Great tool for Meditation practice. Yoga students love this as a Blanket/Bolster option. Takes up less space to store in a Studio environment. Sides; made from Black Cotton Blend. approx. 11'' x 15'' x 5'' thick. Because Cushions are handmade, sizes may vary slightly. Each Buckwheat Cushion is Handmade with Love in the USA. To wash: Remove Buckwheat Hulls; wash Cushion Cover by hand in COLD water, Hang/Air dry, very LOW iron if needed. **All Cushions and Bolsters sold separately.